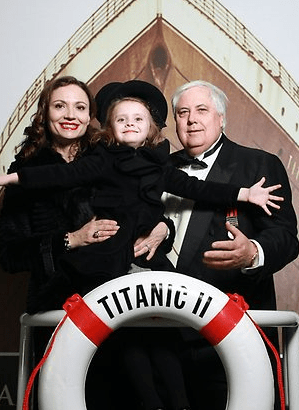 Mining billionaire Clive Palmer, who resides on Queensland’s Gold Coast, has said he would like another child to his second wife Anna, whom he married in 2007. Both Mr and Mrs Palmer’s previous partners died due to illness. The couple have one daughter, Mary, who was born in 2008. Clive has two adult children to his first wife. “Unfortunately, I haven’t been able to have any more children because Mary sleeps in the bed between me and Anna every night and pushes me out of the way,” Mr Palmer was reported saying as stated in The Courier Mail in May last year. It is probably relieving to know that no matter how much money you have – life’s simple pleasures can still be the hardest to obtain. 60 Minutes showed Mr Palmer tonight and his vision for Titanic 2 – which is scheduled to start this year and set sail in 2016. Titanic 2 will be a replica of the original Titanic 1 that sank 100 years ago. Clive said he doesn’t hear his sceptics and he has a dream to take up the challenge. So, a man who plans to build Titanic 2, has a bed dilemma because his 5-year-old sleeps between him and his wife and resists to move! So if that doesn’t put some of life’s dilemma’s into perspective – I am not sure what does! Clive is renowned to be an outspoken, self-made billionaire with dreams and a normal life with a 5-year-old! Clive Palmer once said in an ABC Radio interview: “A lot of people get the wrong idea about money and its use. The most important thing is the content of your character. You can only sleep in one bed, you can only have one meal, you can only go out with one woman at a time if you’re a smart guy”.